It’s not all about family camping, some 8-person tents have been to the highest mountain tops. We’re going to look at some interesting variations on 8-person tents. One is designed for the classic family campout at a state or national park where the tent can be transported in the trunk of the car. A second will be a bit more robust in terms of features and comfort especially for a mixed group of friends as opposed to a family group. The third is an expedition model. It has some unique characteristics that allow it be portable, a bit lighter in weight, and more resistant to inclement weather, snow and wind. Whether it’s a tent that sleeps one or a tent that sleeps eight, there are some standard features that always need to be considered. Ease of setup. If you’ve ever tried to set up a tent in the dark with only a couple of flashlights for illumination, you already know why ease of setup is so important. However, the first time you setup any tent will be a bit of a challenge as you try to figure out parts and pieces and the steps to assembly. It would be wise to setup your tent in the backyard at least once so you get a sense for how to make and break camp. There are essentially two types of tents in terms of seasons. One type is the 3 season tent and the other is the 4 season tent. The fourth season is winter. 4 season tents have a dome shape that repels snow. 3 season tents tent to be a square or rectangular configuration with a gentler sloping pitch on the roof and are sometimes referred to as a tunnel style tent. Water resistance. Nothing ruins a night in the wilderness faster than a tent that leaks or gathers water on the floor. If your car is parked close you can always bail out of the tent and spend the night in the car. If you’re at a remote location or in the mountains it’s a whole different story. All three of the tents were reviewing have high marks for water repellency. However, even if a tent has a floor built in you should put a tarp down on the bottom of the tent just in case. Wind resistance. This is a feature that few people think about. The mountaineering tent we’ll review has a dome shape and good wind resistance, but the key to a wind resistant tent are excellent tent pegs that anchor well into the ground and flexible corners that can support the flex and stress on the tent walls. This is particularly important if you’re going to be spending any period of time with 7 other people in the tent with you. Ventilation in a tent is accomplished with vents in the ceiling and screen door and windows. There is usually a flap that zips up to cover the screens in the event of cold winds, rain or snow. Even then, some ventilation is necessary to keep the interior area fresh and to vent any carbon dioxide buildup from 8 sleeping campers. Room divisions. Most 8-person tents have room divisions and they exist in the three we’re reviewing. This is very much a privacy factor as a mixed group of people go about changing clothes or simply sleeping. Fabric awnings over the door and windows. A dedicated entryway or screened area or a vestibule to the main area of the tent. Loops and lines in the ceiling for hanging battery powered lanterns, clothes lines or additional dividers for more privacy. Ceiling height can be important. It’s nice to stand in a tent especially when you’re getting dressed. You may find that standing room is limited in a domed, mountain tent but it’s typically very roomy in the traditional campsite tents. A rain fly is also an option with some tents and is often standard with mountain tents subject to high winds and severe weather. It also provides somewhat of an insulating factor but only to a small degree. The 3 tents we’ve reviewed represent a range of features, options and benefits. All will sleep 8 people and all are highly rated by their owners. The price range is significant from a family tent at around $200 to an expedition model closer to $1,500. The Coleman 8-Person Instant Tent is the low-price entry in this group (check here for the latest pricing). It is very easy to setup, has 140 square feet of floor space, and is the best choice for traditional campsite camping with a family or friends. It is a 3 season tent intended for late spring, summer and early fall. 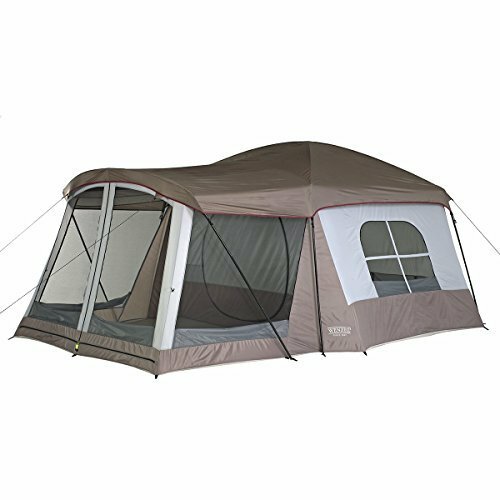 The Wenzel Klondike 8-Person Tent is a bit pricey (check here), but it is also very highly rated and has a screened porch feature that also serves as a sleeping area. It is very weather resistant and is also a 3 season tent. The combined space of the main room and the vestibule or screened porch is 165 square feet. 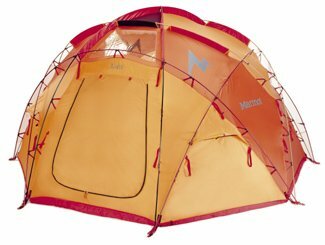 The Marmot Lair 8-Person Tent is a serious expedition tent for extreme conditions such as mountaineering and cold weather camping. It is a 4 season tent and has a main room and a vestibule with a combined living space of 168 square feet. Like most expedition quality gear it’s very expensive (check the prices here). This is a very large tent with 140 square feet of interior space. It’s pictured above without the rain fly and all screens open, and battened down with the rain fly for cold or wet days. The rain fly is an additional $35. It has a divider that creates two rooms in the tent. One in the front and one in the back. It’s designed for quick assembly and according to Coleman it can be setup in 1 minute or less. This is largely due to the fact that poles are preattached. Many owners like this “preattached” feature because there is not the risk of losing a tent pole. The tent features 2 doors and 7 windows. The two doors allow people in the two separate rooms to have access without bothering anyone in the other room. The divider between the rooms is removable. 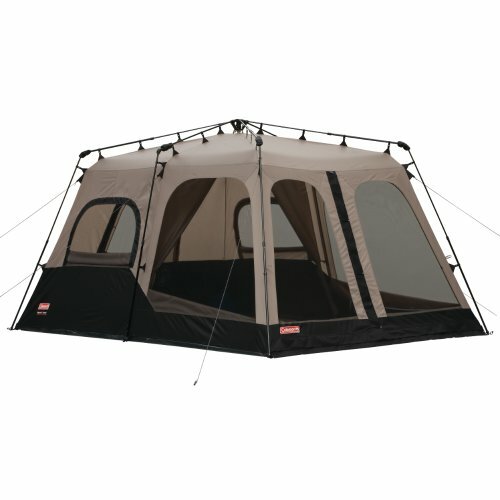 The tent has a built in floor and is described as waterproof by Coleman. The center height in the tent is 6 feet, 5 inches and it weighs 36 pounds. This tent has 100 square feet of living space in the main room and an additional 60 square feet of space in the attached vestibule. Both rooms can be sealed with interior flaps allowing 5 people to sleep in the main room and 3 more people to sleep in the vestibule area. It offers double staking on the corners to increase wind resistance. It also has a full mesh roof option with a rain fly or nighttime cover. The frame is fiberglass and it was designed to be highly water repellent including lap-felled seams that act like rain gutters. In addition to the screened entryway, there are two screened windows on either side of the tent. It has a center height of 6 feet, 5 inches and an eave height of 5 feet and weighs 27 pounds. This is a very serious 8 person tent. It’s intended for extreme weather, mountaineering base camps or any occasion where snow, rain and wind combine to create adverse conditions. In that regard it is a 4 season tent. The floor area is 165 square feet and it has two doors plus a vestibule. The vestibule area is 40 square feet. It has precision venting and a clear plastic window in the ceiling. It also has an optional rain/snow fly that is recommended for extreme conditions. The floor is removable and it features interior pockets for gear organization. Like other dome tents, this one is not so easy to setup. You should definitely practice assembly and setup before you get to your location. its packed size is 24 x 30 inches and it weighs 26 pounds. The choice of one of these 3 best tents is really about your style of camping and whether you are a 3 season camper or need a 4 season/winter option. The prices seemed to vary from one site to another but the prices identified in this review seem to be the average retail price. You can probably find a better deal by shopping around on Amazon, but a lot of that will depend on existing inventories and the time of year. The Top Deals: For deals tracking, check out this page with the hottest discounts on tents right now. Looking for Something a Bit Bigger? Check out this page for our best 10 person tents. Looking for Something a Bit Smaller? 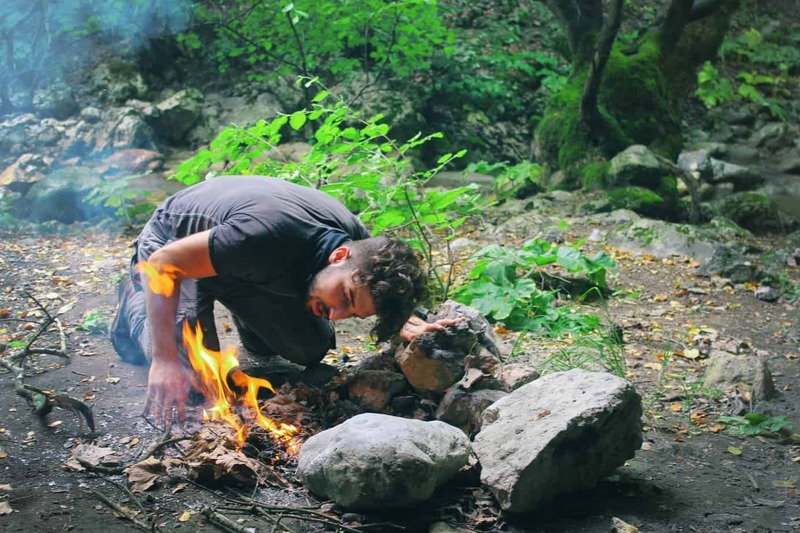 See this guide for the top 6 person camping tents.